Manufactured under controlled cleanroom conditions, this clear robust polypropylene container has a wealth of features which make it a laboratory essential. 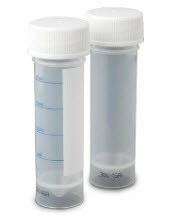 With a working volume of 25 mL and convenient self-standing conical base, it’s perfect for a wide range of general laboratory uses from sample handling to centrifugation applications. There are no threads in Thermo Fisher Scientific Sterilin Certified Universal Containers – RNase, DNase, human DNA and Pyrogen Free Reviews at this time.